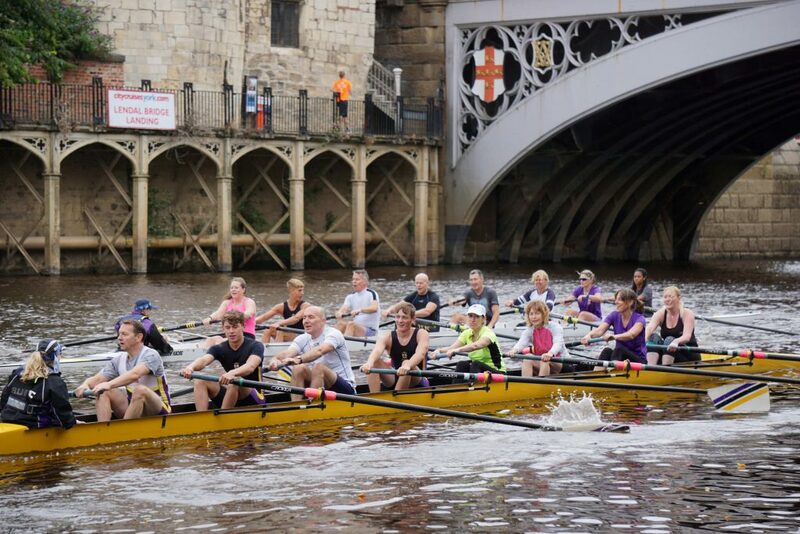 YCRC members came together today for some scratch racing followed by tea and butties to celebrate the official opening of our refurbished bar and balcony. The result of hours of voluntary work by Rebecca Marchant of Spice Interior Design and Lesley Anne Kinney of Bespoke Decorative Finishes, with help from a band of YCRC volunteers, the bar space has been transformed from an area that was showing its age, to a bright and airy space that is welcoming to members throughout the day and evenings. The work was carried out on a shoestring budget with help from a number of local businesses who provided material at reduced or no cost: The Queens Hotel, Howarth Timber, Junk and Jewels, Fastpack, and Nick Milner at Silviculture Ltd.
Mixed scratch eights racing on the boathouse straight for the bar opening. Photo: L. Cooper. After racing in scratch eights along the boathouse straight, members from the junior, senior and leisure squads gathered to watch the ribbon cutting and partake of the traditional YCRC spread of butties, hot drinks and cake. 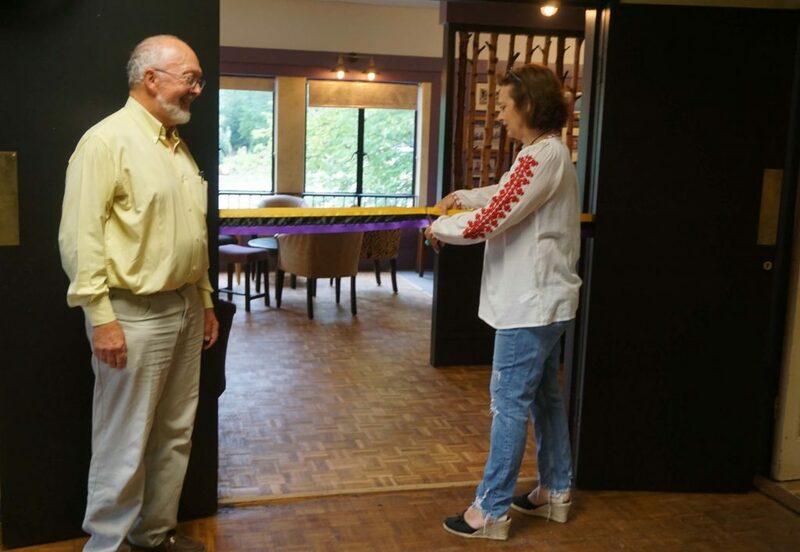 Rebecca Marchant and John Sparrow open the refurbished bar. Photo: R. Inglis. With refurbishment carried out on a restricted budget, the new space is at the heart of a range of club socials to bring members from different squads together, as well as being an inviting venue for private hire by members, a valuable source of funds to support the club, and has been the subject of much admiration by visitors to the club and members alike. 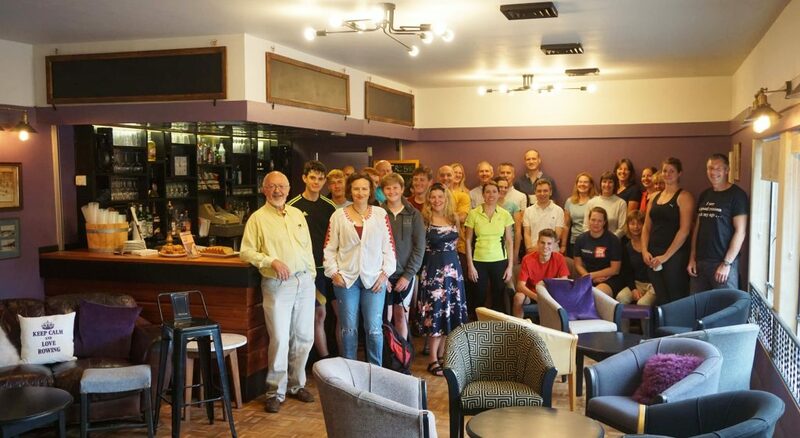 Club members at the opening of the refurbished Bar, August 2018. Photo: R. Inglis. The very biggest YCRC thankyou to Rebecca and Lesley, to all the businesses who supported the refurb, and to Helen and Luke for organising the event and our President John for his kind words. Here’s to many great times in bar in the future!